On this page is where we will feature the different options for your headdress and other parts of a costume that you use in your head like headdress, mask, wig, hat, hair band, pins and more. For other ideas, please use our image below to request one. You may use your very own ideas apart from what you can find on this website and we will turn them into reality. Remember that we have artists doing the job for us and not just your ordinary fly by night workers. Artists who are qualified and with professional inclination to the subject. 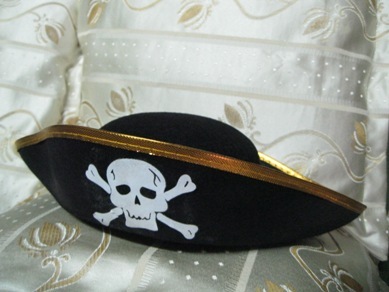 This is our pirate hat (Captain Hook Hat) in Peter Pan movie. 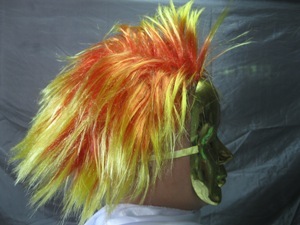 We have this as part of our Halloween costume accessory which is currently available for sale and rent. If you are interested to buy this or have it rented, please contact us send us an email of your concern. The price of this accessory is Php 250.00 pesos if you want to buy it. Rent is not yet priced due to the cheap cost. Please note that we will also have this hat available for kids and pet dog or cat.